Direct Manufacturer of sashes , Graduation Stoles and honor cords. At Graduation Product1, we truly understand the importance of graduation day to all students and this is one of the reasons why we are here to provide them with affordable and durable graduation supplies and products that will fit with their needs, taste and desire. We also offer to our valued clients with their own purchasing process that is designed and intended for purchasing agents and students who wants to avail their graduation supplies and products. We are very proud and willing to work with each level of educational process that includes institutes, career colleges, trade schools, vocational schools, colleges, academics and universities. 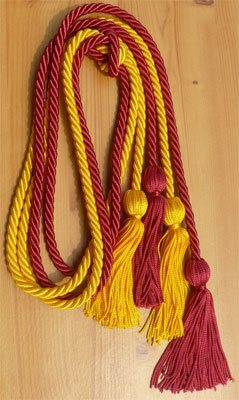 Buy honor cord at Graduation Product1, and visibly recognize that your scholar, he or she will be graduating with high scores and flying colors. 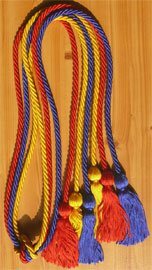 Graduation Product1 is the leading source of honor cords available in various colors including Single Honor Cords, Double Honor Cords, Multi Color Honor Cords and many more. Another best thing about this online store is that you can purchase Graduation Honor Cord for as low as $0.99 and this could be lessened once purchase in bulk. So what are you waiting for, call customers hotline now and place your order. Graduation Product1 also offers customized graduation accessories that will surely bring a meaningful and colorful memory to your special time of your life. We have custom graduation stoles are made of the best and high quality components and make your graduation look great and grand. Our stoles utilized by the most prominent universities, sororities and fraternities. Make your graduation unforgettable and memorable with a high quality stole to cherish for the rest of your life. To customize it, you can put in a sorority and Greek fraternity letters, a custom thread color in order to match the school letters, the school emblem as well as your our name. A stole for graduation is without a doubt a great way to convey pride in your legacy as well as your achievements. At GraduationProduct1 we understand that graduation is an extremely time sensitive and memorable event and with that understanding we guarantee the highest degree of customer service and on time deliveries.Our purchasing process for graduation supplies is designed to be easy for students or school purchasing agents, with custom stoles available on bulk or recurring contracts.We are proud to work with customers at every level of the educational process, from elementary to higher education, including universities, academies, colleges, vocational schools, trade schools, career colleges, and institutes of technology. 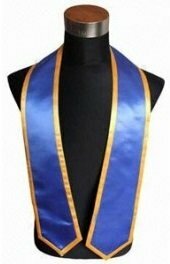 Personalized graduation stoles and sashes for all graduates, multicultural programs Greeks, fraternities and sororities. Hundreds of unique high school and college graduation gifts. 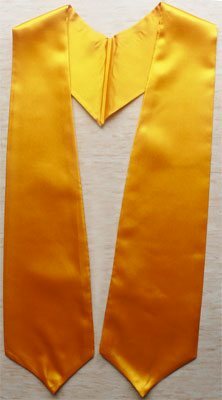 GraduationProduct1.com Store for Graduation Stoles & Graduation Sashes - Customized graduation stoles and sashes. Graduation stoles, graduation sashes, pride sash, graduation stoles, kente, graduation sash, graduation stoles, sashes, stoles, sash, stoles, pride sash.GraduationProduct1.com supplies graduation sashes & graduation stoles for graduates to wear as a keepsake on graduation day. Order your custom graduation stole now ! I was impressed with how quickly we received our order. The price was good and the product was exactly what we wanted. Thank you, GraduationProduct1, for your excellent customer service!